Al Franken: State ruling on Monday is "incredibly humbling"
MINNEAPOLIS, Minnesota (CNN) -- Democrat Al Franken declared victory in the hotly contested Minnesota Senate race Monday, saying the win is "incredibly humbling." A Minnesota board says Al Franken won his U.S. Senate race against Norm Coleman by 225 votes. The Minnesota State Canvassing Board on Monday certified the results of the recount of Republican Sen. Norm Coleman's fight to retain his seat against Franken. The results showed Franken with a 225-vote lead. 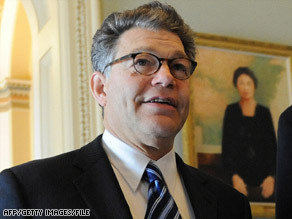 "I am proud to stand before you as the next senator from Minnesota," Franken told reporters Monday night. "It's clear that we have a lot of important work to do ... I'm ready to go to Washington and get to work as soon as possible." Coleman's attorney, Tony Trimble, said shortly after the ruling that the campaign will officially file a lawsuit. The Minnesota Republican's campaign later announced that he will make a public statement on Tuesday afternoon. The initial count from the November 4 election put Coleman, a first-term senator, 215 votes ahead of Franken, who is known for his stint on NBC's "Saturday Night Live" and as a former talk-show host on progressive radio network Air America. In Washington, the Senate's majority and minority leaders staked out opposing positions on the matter of who will serve Minnesota alongside Democrat Amy Klobuchar. "There comes a time when you have to acknowledge that the race is over," Majority Leader Harry Reid, D-Nevada, told reporters. "The race in Minnesota's over. Now it's only a little finger-pointing. The certification by the canvassing board, which has been in process for a number of weeks, now clearly shows that Al Franken has won." Minority Leader Mitch McConnell, R-Kentucky, said: "The law in Minnesota requires certification from the secretary of state and that can't happen until the conclusion of all legal battles. It's not over." Republican National Committee Chairman Mike Duncan echoed McConnell's criticism. "The efforts of Al Franken, Harry Reid and Chuck Schumer to steal this election and seat Al Franken despite not having an election certificate are unprecedented," Duncan said in a statement. "I am confident that if the law is followed, Norm Coleman will be taking his rightful seat in the U.S. Senate." Republican Sen. John Cornyn of Texas, the chairman of the National Republican Senatorial Committee, has pledged a GOP filibuster if the Democratic-controlled Senate attempts to seat Franken before all legal battles play out and before Minnesota Gov. Tim Pawlenty, a Republican, can co-sign Minnesota Secretary of State Mark Ritchie's certificate. Reid said there would be no effort to seat Franken on Tuesday, the day new senators will be sworn in. Meanwhile, in a move that leaves a post-election legal challenge the last hope for Coleman, Minnesota's high court earlier Monday denied his campaign's request to consider about 650 additional rejected absentee ballots. His attorneys had said those ballots should have been included in the count of mistakenly rejected ballots that were tallied over the weekend. The Coleman campaign also said Monday that there was no uniform standard for local officials and campaigns to review and tabulate these improperly rejected ballots. Previously, the court had ordered that only ballots that local officials and both campaigns could agree were rejected in error could be counted. A consensus was met on about 950 of 1,350 originally found by local officials. The court ruling suggested Coleman's latest request should be a post-election consideration. The Coleman campaign, meanwhile, said it was determined to take the question to court. "Today's ruling, which effectively disregards the votes of hundreds of Minnesotans, ensures that an election contest is now inevitable," said Coleman attorney Fritz Knaak. "The Coleman campaign has consistently and continually fought to have every validly cast vote counted, and for the integrity of Minnesota's election system, we will not stop now. The Minnesota Supreme Court has made sure that an election contest will need to be filed quickly in order to ensure that an accurate and valid recount can be achieved." Coleman, who just finished his first term as senator, led Franken by 206 votes at the end of the original vote count in November. The margin automatically triggered the recount, which was hampered by multiple challenges from both sides. Coleman switched to the Republican Party from the Democratic-Farmer-Labor Party, which Franken now represents, in 1996, after two years as St. Paul's mayor.